I was working at my desk some day the other week, largely chair-dancing to select songs in the Hotline Miami OST and pondering at what time to stop working and start finishing my bottle of vintage port while playing some Witcher 2: Assassins of Kings. BLOING! The Facebook noise loudly presented itself through my headphones. I received a message from James Cook, a previous colleague and social media marketer for Zealous, a creatively centred social media start-up company. Being a hugely savvy and successful businessman, it only made sense to at least have a look at the site and see what the noise is about. However it would be poor journalism to just vomit out the PR statement, I’ll leave that to the news companies. Instead I’m going to have a chat about how most social media websites are really bad at presentation of their users work. Throughout my career, the presentation of my public collective work has always been a huge deal. Ever since my work was taken seriously, my portfolio has always been visually tightly controlled, opting for a more classy, customised graphic design over simply slapping my work on Facebook and hoping for the best. One of my old website designs before moving here to wordpress. Even before my career headed in the direction of the film industry, it was obvious that a clean presentation with no distractions, and certainly no links to the competition must be used. No over the top Flash animations, no music, no overly complicated menus, just easy to access photographs and information. I purposefully use white text on grey / black backgrounds because anything else, even white can distract from the main content and betray meaning from the author of the works that might not be there. I want my audience to take my work as seriously as they would an excellent film at their favourite cinema. This is why I provide and recommend the PDF download of my portfolio to be seen in full screen mode. Zero distractions, HUGE, beautiful pictures, and total accuracy of colours. It’s a bit more effort than just clicking on the very same jpeg images on the page, however I hope that at least some people have taken the effort. You might also notice that no-where that I personally present my work on-line will you find the photos in my portfolio separate from their page in my portfolio. This is because I want to have at least some semblance of control over the environment that they are seen in. Unfortunately I cannot rely on this site alone to market my work to the wider audience. I also rely on various social networking sites to slowly spread the great word of Marc. Rarely do these sites do any favours in helping their users present their work however. Lets have a look at a few examples. See if you can recognise your user picture on the chat bar! If you do, you win a nothing! Facebook does absolutely zero to lend its user credibility or authority to their works. Distractions everywhere, links to other pages , and a UI that is ever-present, it’s a site used for sharing photos to your mates, not to showcase a professional body of work. If anything, Facebook stamps it’s authority on content creators, rather than content creators using Facebook to present their authority to the audience. It’s impossible to avoid comments, photos are hugely compressed and you’ll never get rid of that blue and white background. It’s nearly impossible to brand yourself or your work when you’re having to constantly fight Facebook’s omnipresent branding of their own website. While Flickr is less overtly hostile to content creators, it still fails when it comes to presentation of grouped photographs because the UI is just so slow and clunky. Unlike Facebook, Flickr doesn’t compress images, however they do not make the original file easily obtainable unless cash is coughed up, in the age of totally free cloud storage systems this just isn’t acceptable. Even if the account has paid into Flickr, access to the original files is still FOUR clicks away from the thumbnail in the gallery, that is way, way too much. Their fullscreen mode is also not fullscreen! 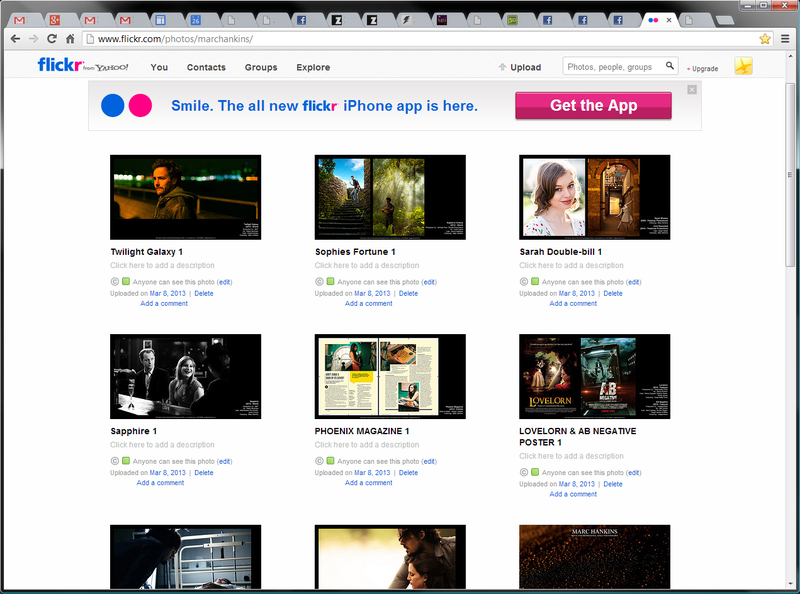 The image is bordered with Flickr’s UI, which while coloured with a neutral grey, is still an uncontrollable distraction. An interesting one. I like it more than I should. BIG Photos! Immediate access to a REAL fullscreen slideshow! Sweet. Considering that Google aren’t explicitly known for media showcasing, they’re doing a good job of showing everyone else how to do it. 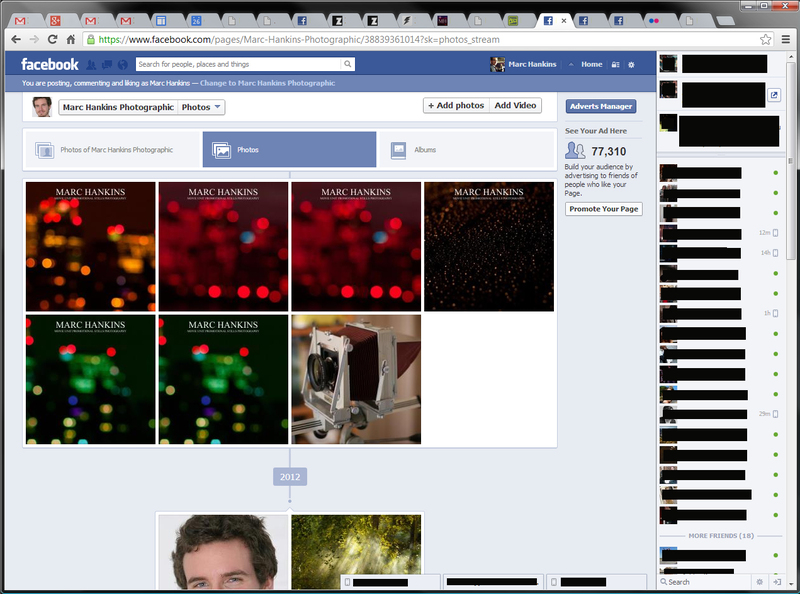 On my profile page, I’m able to fill the area with a single, huge photograph with almost nothing in the way! Fantastic! 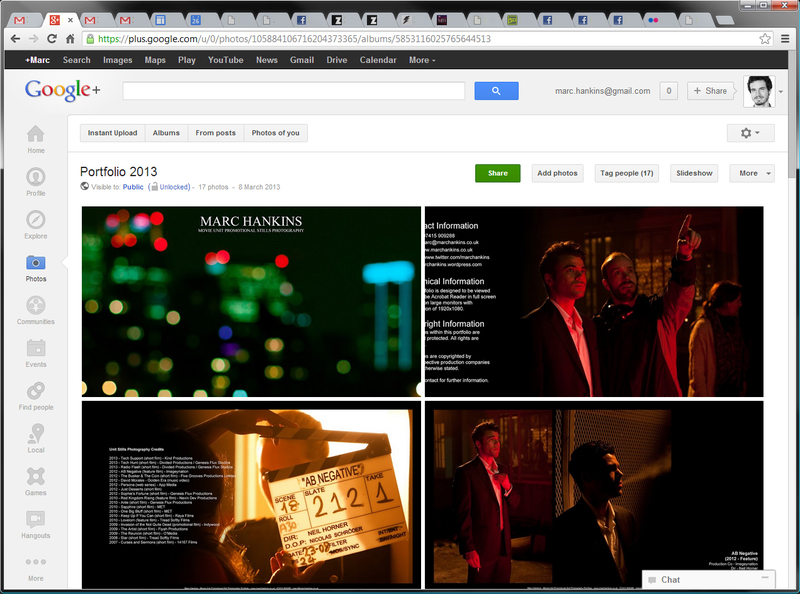 Unfortunately finding my portfolio is a little bit out of the way, however it’s far from frustrating to find. The actual gallery is lovely though, there is very little branding, little in the way of distractions, large, if slightly compressed images, and a really easy to find fullscreen slideshow which has zero distractions. Perfect. Ish. The only niggle I have is that when viewing individual photos, the white comment bar on the right really sticks out against the otherwise very dark UI, almost ruining the point of the darkness altogether. While I would never personally use DeviantArt as the site to showcase my work to clients, the audience there is too huge to ignore. So apparently I’ve been shooting bikini adverts with Myleene Klass! Wait, no. No I haven’t. As lovely as she is, I don’t particularly fancy Myleene themed adverts squeezing me out of my own space on the internet! I also completely fail to see why a stranger would have any care in the slightest of how many banal comments the community has decided to throw upon my work. Additionally, when I click to view an image, to the side of that image is a 3 x 15 grid of images that are totally, and utterly unrelated in any way shape or form. I do not want this work associated or indeed anywhere near my name. Even if they were my own works, it would be a massive distraction. Adverts do not create authorial authority. At all. Ever. 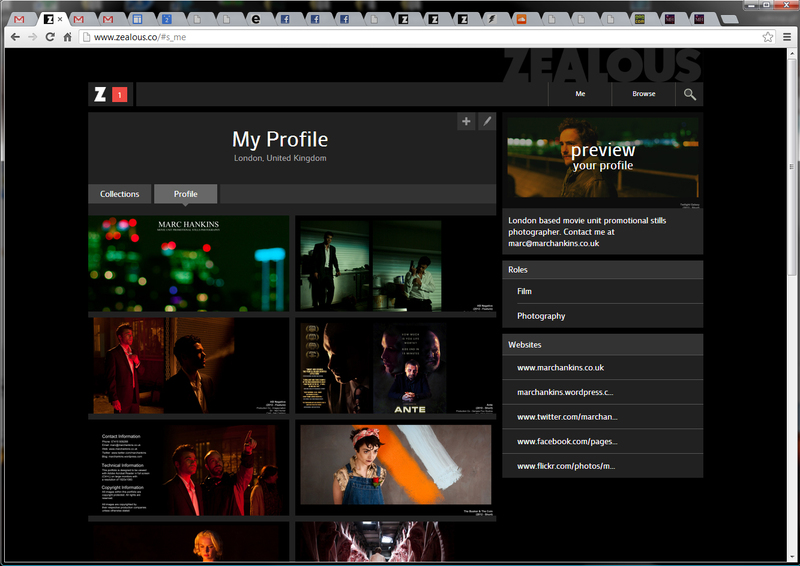 I’m not even going to get into DeviantArt’s frankly bizarre green/grey colour scheme. It’s an uglier version of Facebooks branding and does nothing to assist the presentation of the works on the site, despite it’s claim to be a site for the artists. No, it’s more a site for the advertisers. Clean, neutral colours, no distractions. Happyface. My immediate thoughts about Zealous? Nice presentation. Very nice. The dark colours, a total lack of advertising, a clean, modern user interface all add up very nicely. While the images on my profile page here are quite a bit smaller than Googles efforts, they outsize both Flickr and Facebook. The automatic 16:9 cropping of images also enable the sheen that oozes quality work. Having spent time uploading my portfolio images to Zealous, it’s one of the few social media sites where I wouldn’t mind showcasing my work to clients. Obviously I would still like total control of how someone views my work, however the themes used here are very much aligned with my ideals. It’s professional looking enough that you would take the work seriously. Quite mysteriously, the quality of work on zealous as a whole seems to be extremely high, which currently lends the idea that the community as a whole is very, very good. The polar opposite of DeviantArt, where the vast bulk of it’s users are younger aspirationals rather than working art creators. Presentation matters a lot. It defines yourself as an artist almost as much as your work. Don’t be surprised if people fail to take you seriously if the only way to publicly display your work is on Facebook. Also, having completed The Witcher 2: Assassins of Kings since writing this article I have to say that it’s a beautiful game, and has a level of talent behind it that the movie industry should be aspiring towards. This entry was posted on May 2, 2013 by marchankins. It was filed under Photography and was tagged with Facebook, Flickr, Google+, marketing, Photography, Photography business, Social Media, UI, Zealous.